about their latest track, Hot Handed, and how it all came to pass. I was curious to learn why the Yorkshire natives relocated to London and what sort of music drives them – they recommend a new artist to look out for that is primed to go far. The guys reveals the albums special to them and when we can see them perform; which artist they’d support on the road if they could and whether they have plans for more material – the members each choose a song to end the interview with. Matt: Great, thanks. We launched our new single last week, so mainly recovering from that! Dom: Of course. We’re a London based three-piece. Matt is on acoustic guitar and lead vocals, Tim on electric guitar and I play cello and do backing vocals. We make kind of layered, Folk-infused rock. Hot Handed is your new single. Is there a tale behind the song at all? Matt: Yes. It was inspired by two separate sets of events going on around the time of writing. The first was watching friends - and in particular Tim - get married and the other was seeing the impact of dementia on my grandparent’s relationship. I suppose it was an attempt to give some advice that I’m not qualified to give – make the most of special relationships, pursue them in good faith and hope for the best...because you never know what might get in the way down the line. The song is quite unconventional in terms of its lyrics. Do you feel too many artists lack that original approach to songwriting? Matt: I feel like it’s an aspect that sometimes get ignored or overlooked in the quest for killer melodies and hooks, but these things are definitely not mutually exclusive and there’s plenty of cracking songwriters out there trying to use words inventively to say something. You are Yorkshire natives but live in London. How did Sincere Deceivers find one another? Tim: Matt and I were at college together back in Yorkshire and played in early line-ups of the band before heading off to various places for uni. After a break for a few years, we both ended up in London again and then roped in Dom, a friend of Matt’s, to make us a trio. What is life like for a young band in London? Dom: Unfortunately, I’m not sure we can get away with describing ourselves as young anymore - but London is a great city. There’s certainly lots of music going on and we’ve met some great people along the way. I play in a couple of other London based bands too. Do you have plans for more material a bit later this year? Matt: Yes! We’ve written a few new ones over the last six months and we’re keen to get back in the studio. Watch this space. When you were all growing up, what sort of music inspired you? Tim: Matt and I were listening to a lot of Pop/Rock bands before we started playing together: The Beatles, obviously; Dylan and singer-songwriters like Tom McCrae, Damien Rice and Folk music like Kate Rusby. My parents introduced me to local folk songs from a young age. Matt: I remember Urban Hymns by The Verve being one of the first albums I bought and thinking that was pretty cool. Rock music with an epic strings section. Bright Eyes were a formative discovery. Dom: Muse; dad’s Pink Floyd and lots of choral stuff. Tim: We launched our first E.P. 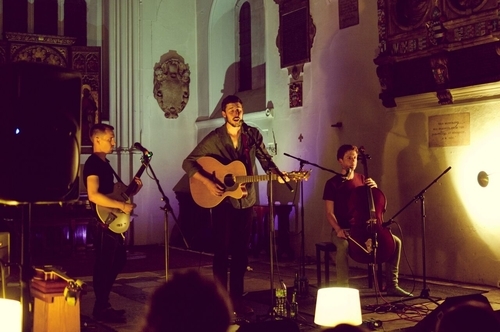 together at St. Pancras Old Church and that was a special night. Because it’s the perfect combination of balls-out Rock and Roll with plenty of guitar wizardry, but so much emotion. Matt: That Buckley album is special. I thought about this for a long time without anything definitive popping in my head. The album that has been on the heaviest rotation for the last seven years is Given to the Wild by The Maccabees. I just seem to keep going back. It’s shonky, lo-fi; surprising and mad but also emotional moving and intelligent. It’s when I realised you could get away with anything in music as long as you liked what you’re doing. Matt: I’m gonna hijack this one: Scott Matthews. Because I think he’s one of the best singer-songwriters of the last decade and he seems fun. I quite like a sneaky scotch before we go on stage and I think Scott would enjoy one with us after the show too. Dom: Can I have some Tangfastics, please? Dom: We’re plotting getting out and about over the next few months. But, we will be back in London for a headline show at The Finsbury for Lost in the Manor on 7th March. 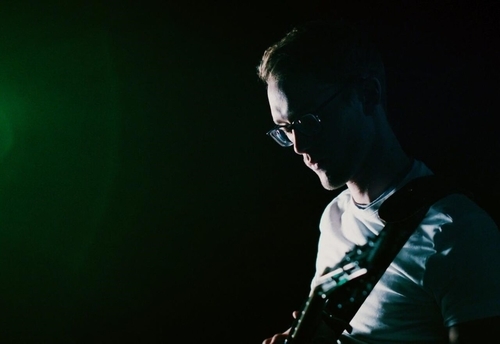 Tim: I’m not sure we have much helpful advice about coming through, but we have been doing this a while and you can get caught up in the gigging and releasing - but then we try and hold to that reason you started, which is normally that you love making music. Matt: Also, look after your ears in loud rooms. Mine are getting crunchy. Matt: The awesome Amy May Ellis played with us at our single launch. We met her through Folkroom Records. They put on amazing fortnightly shows in London with some great acts, including Louis Brennan, Tom Hyatt; Kirsty Merryn and Winterfalle to name a few. Tim: Following my beloved Huddersfield Town. Matt: I quite like walking. FEATURE: Dust on the Crates: Are the Risks Inherent in Sampling Holding Back a New ‘Golden Age’ of Hip-Hop and Rap?